Craig International Ballistics (CIB) is the recognised industry leader of ballistic protection systems in Australia. Through cutting-edge innovation, CIB redefines ballistic protection to meet the critical requirements of the Australian Defence Force and delivering an important sovereign industrial capability priority. Craig International Ballistics (CIB) this year celebrates both its 20th anniversary since establishment and two decades of providing combat ballistic protection to the Australian Defence Force. CIB is a family owned SME business based in Queensland, and is now considered the leading Australian manufacturer of ballistic protection systems. Through recent Australian Army projects LAND 125-3B Soldier Combat Ensemble and CH-47F, CIB has forged a reputation of delivering high-quality ballistic protection systems to meet specific customer threats and delivering a key sovereign industrial capability priority to the ADF. CIB in January 2019 was proud to be nominated for the prestigious Essington Lewis Award for Major Acquisition over $50 million, for the work and product delivered under the LAND 125-3B – SCE Protection Elements contract – delivering over 21,000 sets of innovative and lightweight combat body armour and 50,000 sets of training products to the Australian Army. The company's state-of-the-art and partially automated manufacturing facility gives CIB total control over every stage of production. CIB designs and manufactures specific products, based on a specific threat. A key component to CIB’s success within the market is the strong established relationships with both our Australian and international suppliers, a partnership to success, that is fundamental footprint of the organisation. A great example of local collaboration is with Queensland-based Rhino Linings Australia, which provides CIB with critical ballistic protection coating materials that are now sprayed onsite at CIB’s dedicated spray application facility. 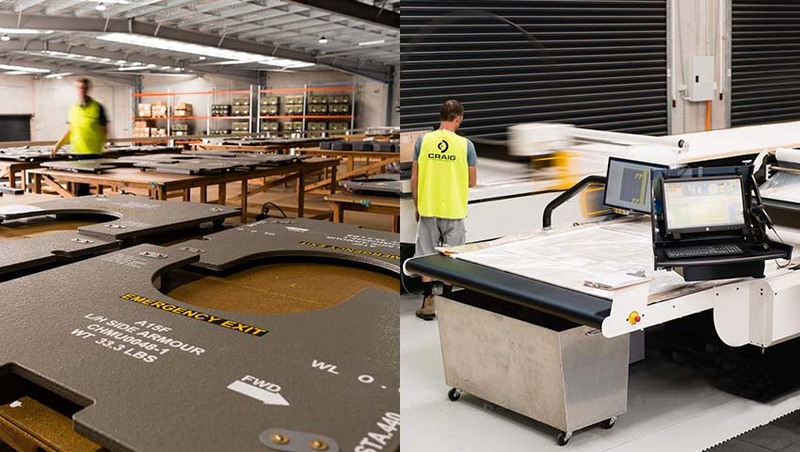 Precise, waterjet cut ballistic protection panels with the range of Rhino Linings Australia coatings are now being exported from Australia in large volumes. Now producing a diverse range of protection systems and products used by Australian and growing numbers of international law enforcement agencies, correctional institutions and Defence Departments, the company's manufacturing capabilities now stretch far beyond that of just a ballistic vest. LAND: CIB is primarily known for delivering combat body armour in the form of soft armour inserts and hard armour plates.CIB delivers so much more. AIR: CIB has recently invested in on-site waterjet cutting equipment in addition to Rhino Linings spray equipment to press, cut and protective-coat ballistic protection panels within CIB’s own facility. This allows for the manufacture of precisely cut materials to meet stringent aircraft tolerance requirements with little to no subcontractor reliance. SEA: CIB has developed a range of composite-based products to meet harsh marine environment requirements. Ballistic protection panel refurbishment and recertification programs. CIB is continually investing in the future of ballistic protection, ensuring lightweight life-saving equipment is delivered on time and on budget. For additional information on our range of products, refer to our website: www.ballistics.com.au.